Over the centuries, various art forms have inspired poets to create their own works of art, termed ekphrasis. 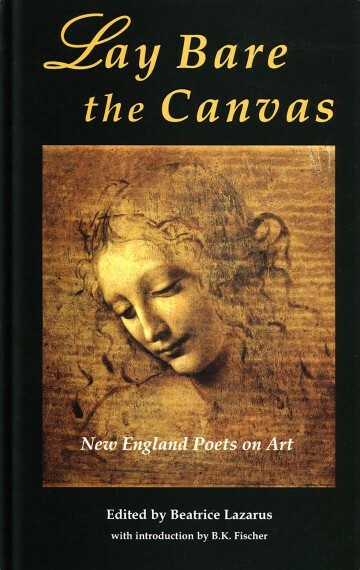 Lay Bare the Canvas seeks to honor and expand this ekphrastic tradition by presenting original poems by contemporary New England poets responding to master artworks in New England museums. … They selected artworks in person or online at http://the-athenaeum.org/ from New England museums from the Colby College Museum in Waterville, Maine, to the Yale University Art Gallery In New Haven, Connecticut, and west to the Clark Institute in Williamstown, Massachusetts. I chose a painting by Maria Okey Dewing, at the Hood Museum in Hanover, New Hampshire. I was taken by the painting’s strength and beauty, but also by the fact that this was a woman of great talent and reputation (she co-founded the Art Students League in New York) whose art and career became secondary to that of her husband, Thomas Dewing. Much of her work has been lost into anonymous private collections. The first thing I have to say is that I am a writer. And I have already decided that I’m going to be a writer for the rest of my life. I told this to my Great-Aunt Helen who visits our family for a week every summer. (My father says she only has one lung which is why she talks and walks quite slowly.) She gave me this box of blue notepaper (my last name is the initial in the middle) as a birthday present. Also a new ink pen that uses cartridges. I have selected a blue-black color which I like very much. Great-Aunt Helen asked me to write to her on a monthly basis with news of my daily life and she would write back with her news. She said this would be an epistolary relationship. Also she has asked me to choose a person whom I admire to write to as well. She gave me some suggestions and I have chosen you. It’s okay that you’re dead because as I said I’m a writer so I can easily imagine writing to someone in another “place.” You probably don’t know this about me but I am a flower lover like you. Daffodils are my favorites but really all flowers make me happy and so when artists paint them the way they actually grow in nature like those irises (did you really get up at dawn to paint them?!) I feel somewhat the way I do when I find the exact word to say what I want to say which must be how you feel when you get just the right shade of purple or the best green. Does that make sense? Also, Great-Aunt Helen said that artists like you are very, very interested in Beauty with a capital “B.” Me too. One more thing we have been writing to each other about and that’s how lots of really good women artists don’t get the same kind of importance as men artists. G-A Helen told me that you stopped painting portraits because your husband was a pretty famous portrait painter and that sometimes he asked you to put your flowers in the background of his portraits which I would say isn’t really fair. I will ask you more about this in my next letter.